by Bill Dwight on Wednesday, April 17, 2013 at 12:12 PM | LEAVE A COMMENT! This is a guest post by Alanna Ritchie. 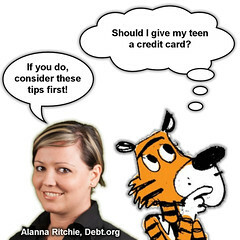 Alanna is a content writer for Debt.org, where she writes about personal finance and little smart ways to spend (and save) money. Alanna has an English degree from Rollins College. Around 70 percent of college students have credit cards, and some of these kids begin their adult years of credit spending unsupervised and unprepared. The consequences can be devastating, as independence is then shrouded in a dark cloud of debt. Instead of waiting until kids are out of the house, some parents choose to take advantage of the years where teens are developing spending habits by overseeing their credit education. Teens can either be an authorized user on a parent’s account — which can be closely monitored — or, if they have verifiable income, they can apply for their own cards. Explain the fine print. 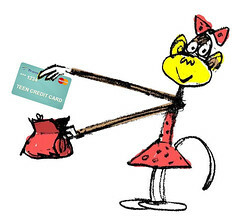 As you introduce them to how credit cards work, make sure to include explanations about fees and interest rates. Understanding the ins and outs of interest rates and how these may change based on activity is critical. Make a budget. Before getting the card, make sure that you both know what the money will be spent on and where the payments will come from. Then, when you get the bill, you can compare your goals with execution and adjust the plan for the next month if necessary. Track spending throughout the month, so that the bill doesn’t come as a surprise. Discuss minimum payments. Make sure they understand the difference between the minimum payment and paying off the full balance every month. Review the monthly bill together. Walking alongside your teen in this process will take more than a few conversations. After the first few bills come in the mail, it’s time to sit down together again. Together you and your teen can examine what is owed and how the money is being spent. Have them pay it off every month. After you finish discussing the bill, it’s time to make payments. Instead of making only the minimum payment, teach teens to pay off the whole balance every month. Getting teens in the habit of doing this while they don’t have to carry the weight of expenses like rent, food and other bills, will prepare them to make the same choices in the future. Keep balances below 25 percent of credit limit. Paying off the balance isn’t the only precaution your teen should take. Teach them how to maintain a good credit score by helping them understand credit utilization. If they have a credit limit of $500, for example, they should only use $125 of it each month. Giving your teen the chance to manage their finances within the safety net of your household can be a valuable opportunity. The truth is that one day Mom and Dad’s rules will no longer matter. Credit card agreements will be the new set of rules, and it will be time for young adults to set some good rules for themselves. This was a guest post by Alanna Ritchie.